John earned his Doctorate of Physical Therapy at Virginia Commonwealth University (VCU) in Richmond. 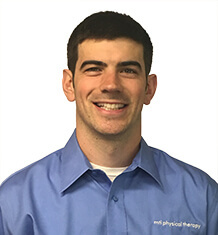 A native of the DC area, he developed his passion for physical therapy at an early age after receiving physical therapy for a variety of sports related injuries. The manual techniques his therapists used led to a speedy return to the playing field. The process piqued his interest in learning about the human body and the value of helping others with their pain. After joining MTI Physical Therapy in 2017, he received his specialization in orthopedic manual therapy from the Ola Grimsby Institute and is currently enrolled in the fellowship program. Since moving to Washington, John’s love for the outdoors has grown. His ideal trip involves backpacking and hiking with friends in the cascades. He is passionate about helping others train for their ideal outdoor adventures through education, exercise and manual therapy treatments. In his spare time, John enjoys attending local community sporting events, backpacking with friends, cooking, spending time with family and playing in competitive games of all kinds.